Part of what elevates installments in the horror genre from being scary to being legitimately good comes in how it reflects upon the monstrosities of humanity itself, how it makes the ugly side of people into something tangible. Unless it's a story based on real events, that sort of commentary typically gets concealed within metaphors and symbolism, creating some breathing room between the enjoyment of the horror from the real-world details of what it sets out to critique, whether it's personal ailments like psychological disorders and sexually-transmitted infections or more social concerns like racism and xenophobia. 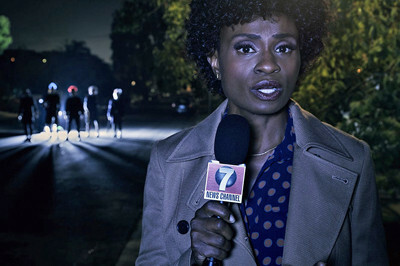 The latest installment in American Horror Story, Cult, not only doesn't try to hide the target of its condemnations, it outright names ‘em -- the 2016 election and the rise of Trumpism -- as the catalyst for the grim events that happen across the season. 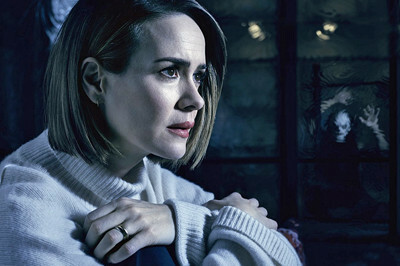 If politics isn't your thing, it'd be wise to bail on AHS: Cult; if it is, prepare for some outrageously heavy-handed theatrics and poisoning of the thematic well, which form into an off-and-on intriguing cautionary tale that's weakened by its real-world connections. There's no getting away from the tones established in those first episodes, but luckily the "political movement" built by Kai eventually guides the show down its own path, moving away from being such a direct extension of "Trumpism" and into a warped extrapolation of what similar ideologies could produce. 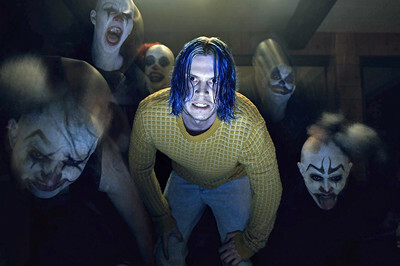 Once the following becomes a tried-and-true cult, this installment of American Horror Story nails down several episodes of interest, in which the presence of the murderous clowns -- preying on Ally's fear of ‘em along the way -- barrels forward on a collision course with the cult's expansion and how characters elect to join up. Certain people surrendering to Kai's techniques of persuasion make sense, soaking in the appeal of his aggressive, anarchistic cleaning of the slate; others, however, have certain sensibilities and moral barometers that make their involvement seem questionable. Perhaps that's part of what the season's about, that a manipulative leader can strike the right chords with unlikely people, but the twists resulting from those decisions are hardbound to the writing and mess with its credibility. Even though the happenings are suspicious, Cult does finally land on a streak of effective anxiety and suspense in showcasing how the parts of the cult's machine start to fit together … that is, until the episode "Valerie Solanas Died for Your Sins: Scumbag" dismantles and reshuffles what's been established. Driven by a thoroughly unconvincing, clumsily-accented performance from Lena Dunham as Valerie Solanas, the episode transports the series back to the late-‘60s to illustrate how the radical SCUM movement attempted to organize the removal of the patriarchy by outright eliminating all males from society. It's a mess of an episode that absurdly reattributes certain historical murders to Solanas' efforts, and, more importantly, it incorporates both misogyny and misandry as complications in Kai's ranks. There was something thematically compelling about how this cult's revolutionary chaos appealed to and accepted people of a broad range of stripes, something that this episode's implications confuse and tarnish in one fell swoop once they tie back into what's happening in the present era.